Why are newspapers and television programmes filled with stories about crime and criminals? Is their portrayal of crime accurate? How do the media transform our attitudes to crime? Is fear of crime, for example, really created by the media? The relationships between crime and the media have long been the subject of intense debate. From the earliest days of the printing press to the explosion of cyberspace chat rooms, there have been persistent concerns about the harmful criminogenic effects of the media. At the same time, the media are fascinated with crime – on the news, in films and on television there are countless stories about crime, both real and imagined. In this innovative and accessible new book, Eamonn Carrabine carefully untangles these debates, and grapples with the powerful dynamics of fear and desire that underlie our obsession with crime. Chapter-by-chapter the book introduces the different ways in which relationships between crime and the media have been understood, including classic debates about the media’s effects, news production, and moral panics, as well as more cutting-edge studies of the representation of crime in the contemporary media. Combining empirical research findings with the latest theoretical developments, the book will appeal to advanced undergraduates and graduate students across the social sciences, especially those taking courses in criminology and media studies. Eamonn Carrabine is Lecturer in Sociology at Essex University. "This book has great insight into the world of crime and the media, and disseminates this knowledge in an easy-to-read form that would appeal to students interested in this topic everywhere." "I always feel that I am in safe hands with Eamonn Carrabine, whose last book was a paradigm. His new book on crime, culture and the media is no less assured and very ably weaves classic debates about the media's effects, representations of crime and agencies of the criminal justice system, news production, and moral panic with Carrabine's personal and lively take on why our news is filled with crime stories and how the media might impact on our view of crime and criminals." "This book is not just another bite at the ‘crime and media' cherry, instead it is a refreshing and sophisticated look at this hotly contested area of debate within criminology and media studies. Tackling this topic with undoubted finesse, Carrabine adopts an interdisciplinary approach that draws upon a solid wealth of existing literature from a variety of fields including fi lm studies, sociology and criminology along with history and psychology. The result is an accessible text that lays a foundation of knowledge by tackling old and existing debates by updating them with the latest research and providing a useful engagement with pertinent material for the study of crime and media to students at both undergraduate and postgraduate level." "Crime, Culture and the Media has the great virtue of combining breadth and brevity. It covers a remarkable range of perspectives and debates that should interest both the initiated criminological scholar and general readers eager to learn more about how crime has been covered across an array of media, past and present ... a laudable effort and a great boon for faculty and students interested in exploring culture, crime, and media in all their overlapping complexities." "Carrabine's book is, without doubt, an impressive achievement. He simultaneously manages to keep one foot firmly in criminology’s 'traditional' debates about crime and media while casting those debates into question by drawing upon a rich array of sociological, philosophical and psychoanalytic resources. It is rare indeed that a book about 'crime and the media' gives serious consideration to the ideas and insights drawn from the likes of Aristotle, Todorov, Levi-Strauss, Levinas, Lacan, Deleuze and Freud. That students (and indeed teachers and writers!) of criminology might be drawn to engage with such intellectual resources through an encounter with this book makes it doubly valuable." "This book brings to bear a sophisticated synthesis of cultural, social and philosophical theories and empirical research in the analysis of representations of crime in the mass media and popular culture. It covers a wide range of issues, examining the impact of media images of crime on fear and public sentiment, the history of news and fictional crime narratives, and their production. It will be a useful text for students, and also offers many penetrating insights to practitioners and academics." "An informed and refreshing look again at the interface between crime and the media. Carrabine's sociological focus on how crime stories circulate in social life makes it an invaluable guide to students and offers new insights to those who know the field well." 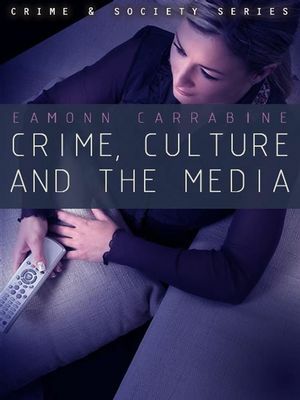 "Carrabine gives us a thorough review of the scholarly literature on the media and crime. If you seek a comprehensive survey of British theoretical and empirical work on crime and the media - one that draws on film and literary theory, history and philosophy, as well as psychology and sociology - this is the book." Covers a core component of undergraduate criminology courses which have exploded in number in the past few years. Most competing volumes are simplistic, whereas this book is more sophisticated and comprehensive. Covers classic debates such as media effects, production and panic-mongering, as well as cutting-edge studies of the representation of crime. Written clearly, but does not shy away from dealing with some complex issues.